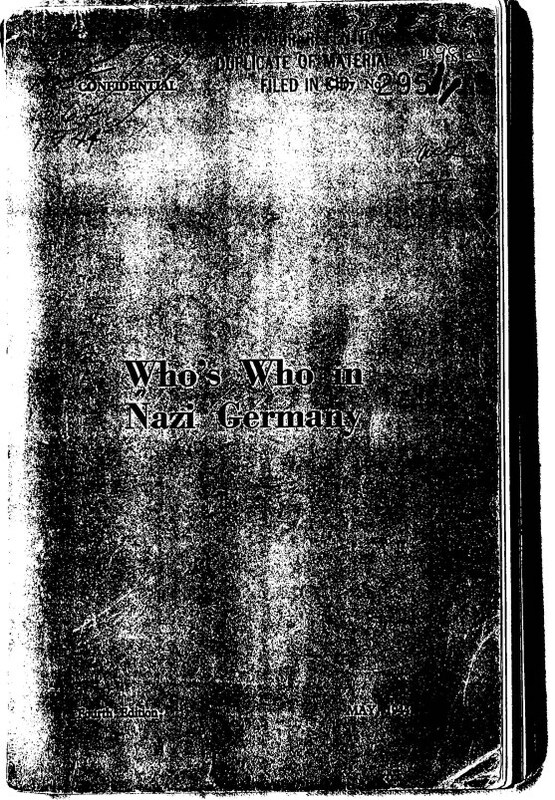 The fourth edition of the OSS' confidential "Who's Who in Nazi Germany," published in 1944, and declassified by the CIA in 2007. I. This Who's Who in Nazi Germany has been prepared for the use of those dealing with propaganda to and about Germany. It is CONFIDENTIAL. The information it contains may be used without restriction, but the source must not be disclosed. II. The present fourth edition has been expanded considerably and includes a number of prominent personalities from the realm of industry, finance and trade. In the compilation of this edition recommendations and suggestions made in connection with the earlier editions were most helpful. Further collaboration of this kind is invited. III. Biographies and photographs of personalities included in this volume as well as more detailed material about many of them and collections of speeches and articles by the more important are available. IV. It is hoped to keep this edition up-to-date by the issue at regular intervals of supplements which will be sent to the recipients of Who's Who in Nazi Germany.